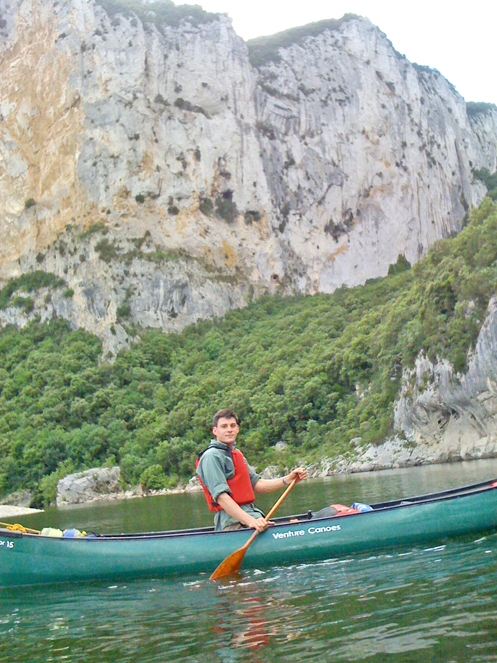 I recently travelled to the beautiful Ardeche gorge in Southern France and spent three days paddling on the crystal clear water with the aim of improving my open canoeing skills. I hadn’t received much canoe training prior to this trip, so I was very keen to get out on the water and learn. The Ardeche gorge is absolutely stunning and as you paddle along it’s as though you could be on the other side of the world. The sheer limestone walls tower a thousand feet above your head on both sides of the river as it twists and meanders for thirty kilometres. Dozens of small cave entrances are visible high up in the rock, many of them never visited and some of them containing ancient evidence of hunter-gatherers. 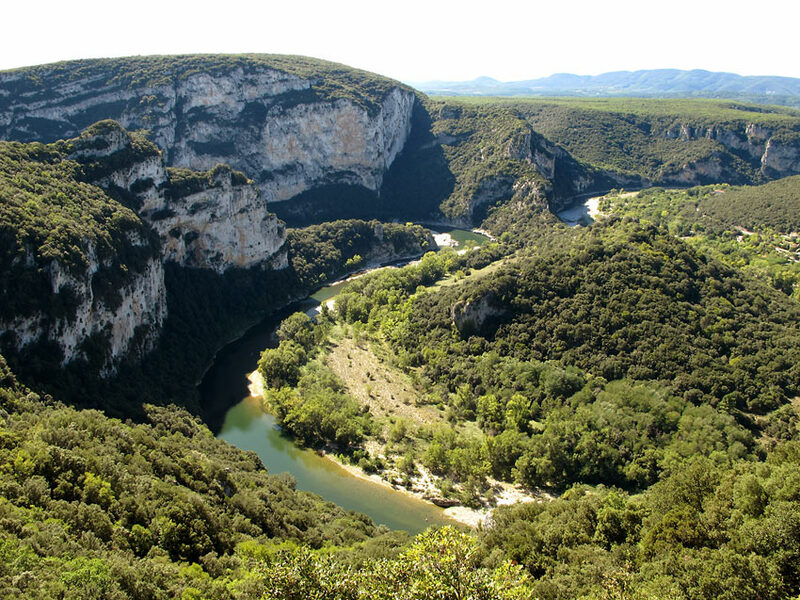 There is one particular cave in the gorge, the cave of Chauvet-pont-d’arc, which contains 31,000 year-old rock art. I was expertly coached by Tony Pape (Blue), who has been paddling for most of his life and guiding on this particular river for more than twenty years. It was certainly a pleasure to learn from him as we descended the gorge. The first day of paddling complete, we set up camp and relaxed for the evening; this gave me the opportunity to walk up to a high point and look down at the stunning landscape below, the silvery river snaking its way through a vast expanse of lush vegetation and rock. One of the things I like about travelling to a new place is having time to wander around to explore and encounter new plants, trees and animals, as it provides a good opportunity to broaden my knowledge. I recognised a few species of plant and tree but noticed subtle differences in comparison to the same species growing in Britain. It’s a very diverse environment and the weather in the gorge can be radically different from outside, huge gusts of wind can appear out of nowhere and catch you out! The second day in the gorge was spent practicing white water techniques and completing the descent. Despite this very popular river attracting thousands of people to make the descent every year, the landscape remains unspoilt and retains its sense of remoteness. A beautiful place. 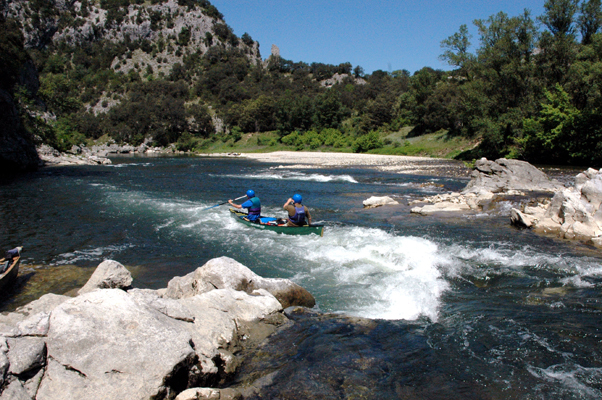 If Dan’s story has inspired you to take a trip in this part of the world, why not take a look at Woodlore’s Canoeing in the Ardeche course. This entry was posted in The Woodlore Team on August 13, 2012 by Woodlore Team.